Transferred to the Archives in August 1963, May 1989, April 1990, February 1994, and February 1996. The records of the School of Veterinary Medicine have been organized into the following series: 1. Historical Material, 1832-1987; 2. Administration, 1887-1991; 3. Other Organizations, 1944-1990; 4. Photographs, 1909-1988; 5. Films and Videotapes, 1973-1984; 6. Artifacts. 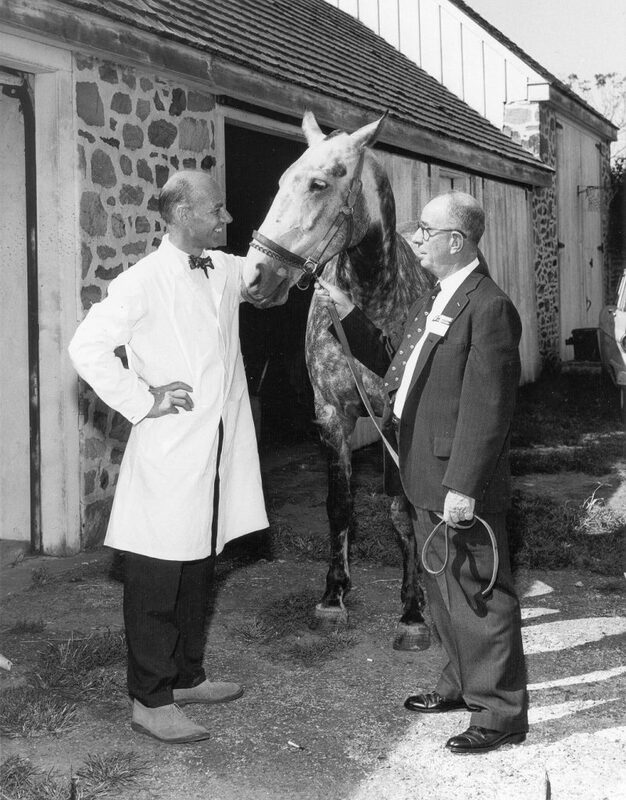 One of the oldest of its kind in North America, the School of Veterinary Medicine of the University of Pennsylvania is the only veterinary school in the United States that was a direct outgrowth of the University’s School of Medicine. In 1807, Benjamin Rush, one of the three original professors of the medical school, proposed that instruction in veterinary medicine be given at the University of Pennsylvania. It was not until 1882, however, that Joshua Bertram Lippincott, one of the University Trustees, donated $10,000 for the purpose of establishing veterinary school within the University. The Board of Trustees appointed a special committee with Lippincott as Chairman to consider plans for inaugurating such a school. In October 1884 the School of Veterinary Medicine was opened with Dr. Rush Shippen Huidekoper serving as Dean. Beginning a century-long tradition of support, the state of Pennsylvania appropriated $25,000 for the School in 1889. This was only the first step of many that have contributed to the rapid growth of the School. In order to make way for the present medical laboratories, the School of Veterinary Medicine moved from 36th and Pine Street to 39th and Woodland Avenue in 1901. In 1905, Dean Leonard Pearson presented plans for a combination of new veterinary school and hospital. Generous contributions, a gift of $100,000 from Mrs. James J. Goodwin (daughter of J. Bertram Lippincott), a bequest of $50,000 from Mr. Joseph E. Gillingham, and more state appropriations totaling $380,000 from 1906 to 1911, allowed for the completion of a new building by 1913. The school has since resided in this building. In more recent decades, the School of Veterinary Medicine, in cooperation with the faculty of the School of Medicine, further specialized the discipline and thus strengthened its status as one of the nation’s leading veterinary schools. The Historical Material series records the school in its formative stage. It features minute books for the Board of Managers, 1889-1954, for the faculty, 1909-1963, and for alumni societies, 1901-1960. This series also includes correspondence of the Deans of the School from 1906 to 1911 and information on Horace J. Smith, a Penn alumni and a stock farm owner who enthusiastically advocated the establishment of a veterinary department at the University of Pennsylvania. There are hand-written notes made by the faculty in preparation for the writing of the history of veterinary medicine at the University and the development of veterinary medicine in the country in general. Finally, a ledger book of the Veterinary Society of the University of Pennsylvania containing the Society’s constitution, a charter member list, and minutes from 1889 to 1898 finish out the series. The Administration series constitutes the bulk of the collection. Included in it are biographical files of faculty members, prominent alumni, and other medical professionals (including some outside of the field of veterinary medicine), some of whom were nominated for awards on the occasion of the School’s centennial in 1984.; records of a historical symposium on veterinary development at Penn held in conduction with the celebration of the 250th anniversary of the University of Pennsylvania; records concerning the celebration of the School’s seventy-fifth anniversary in 1959; and material of the Veterinary Hospital of the University of Pennsylvania. University of Pennsylvania. Veterinary Hospital. University of Pennsylvania. Veterinary Society. Buchanan, James Walter, photo and c.v.
Cohn, Daniel, photo and c.v.
Emmerson, Mack Allen, photo and c.v.
Hahn, Allen W., photo and c.v.
Hubben, Klaus, photo and c.v.
Johnson, Julian, photo and c.v.
Knight, David Harmon, photo and c.v.
Magrane, William G., photo and c.v.
Melbin, Julius, photo and c.v.
Moore, E. Neil, photo and c.v.
Nemir, Paul, photo and c.v.
Pyle, Robert Lee, photo and c.v.
Ravdin, Isidor Schwaner, photo and c.v.
Rhoads, Jonathan Evans, photo and c.v.
Rhodes, William Harker, photo and c.v.
Soma, Lawrence R., photo and c.v.